In the summer of 1939 Blackpool ignored the possibility of war. The huge new Art Deco, 2,920-seat Opera House auditorium opened in the Winter Gardens, starring George Formby Jnr (who was paid £1,000 a week) in a review entitled Turned Out Nice Again. A short distance down Dickson Road the Odeon Cinema, designed by W Calder Marshall for Harry Weedon, opened on May 6th 1939. Its capacity of 3,088 made this the largest auditorium in the company’s chain, bigger even than the flagship cinema in London’s Leicester Square: it cost £82,500. This was one of the relatively few 1930s Odeons intended to have an organ, a magnificent five-manual Compton instrument, big enough to stand comparison with the Wurlitzers in the Tower and Winter Gardens. Oscar Deutsch disapproved of theatre organs: he thought they were a waste of money. As it happened, the Odeon organ was not delivered until after war broke out, and was apparently bombed in the railway sidings at Blackpool. Eventually, in 1946, the Conacher organ from the Ritz, Southend, was installed. The Blackpool Odeon was tripled in October 1975 and closed in 1998. It stood derelict for some years, until Basil Newby recreated it magnificently as Funny Girls [http://www.funnygirlsonline.co.uk], refreshing the meaning of the expression “holiday camp”. For details of Mike Higginbottom’s lectures on seaside architecture, Away from it all: the heritage of holiday resorts, Beside the Seaside: the architecture of British coastal resorts, Blackpool’s Seaside Heritage and Yorkshire’s Seaside Heritage, please click here. The 80-page, A4 handbook for the 2013 Lancashire’s Seaside Heritage tour, with text, photographs, maps and a reading list, is available for purchase, price £15.00 including postage and packing. To view sample pages click here. Please send a cheque, payable to Mike Higginbottom, to 63 Vivian Road, Sheffield, S5 6WJ. This entry was posted in Fun Palaces, Lancashire's Seaside Heritage on January 28, 2014 by Mike Higginbottom. Regular clients on Mike Higginbottom Interesting Times tours are used to finding that the tour contains more than the outline promises. This isn’t simply perverse marketing: sometimes opportunities arise at the last minute, too late to advertise, and I like to have a reputation for providing more than it says on the tin. The guests on the Lancashire’s Seaside Heritage (July 10th-15th 2013) tour were mystified to be taken to see Judith Hunter’s conservatory next to her caravan-site in St Michael’s-on-Wyre, a few miles inland from Blackpool. I told them they would see perhaps the only surviving relic from the Blackpool Winter Gardens’ Big Wheel. The Big Wheel, along with the Empress Ballroom, was the Winter Gardens manager Bill Holland’s response to the arrival of the Tower in 1894. The Ballroom was a great success, and provoked the Tower Company to embellish their assembly room into the Tower Ballroom. The 220ft-high Big Wheel of 1896 largely failed to compete with the higher, simpler Tower, except in one respect: in quiet periods (there were many) young men escorting young ladies sometimes bribed the attendant to hold the Wheel for a time when their carriage was at the top. When the Tower Company took over the Winter Gardens in 1928, almost their first act was to dismantle the Wheel. 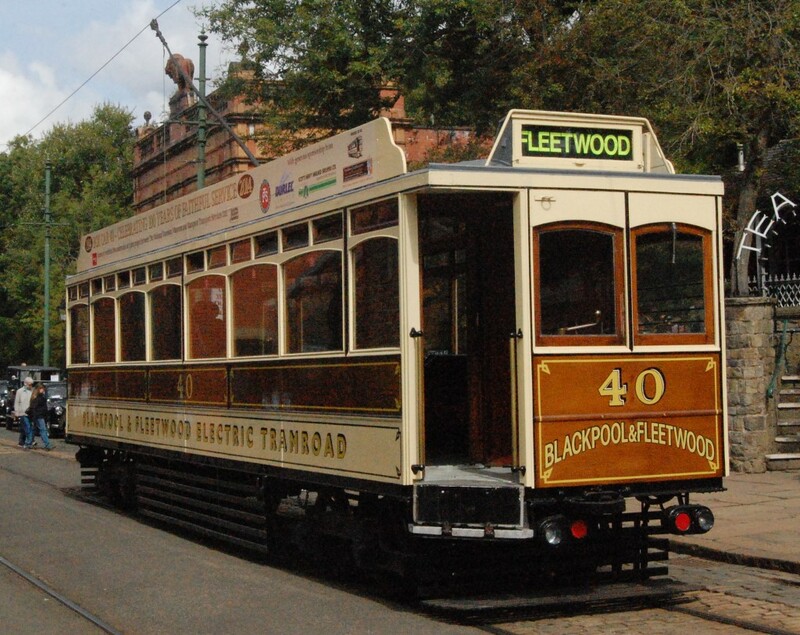 The thirty carriages were auctioned off as garden sheds and summer houses, and Judith’s was bought by Miss Edith Swallow, the first matron of Blackpool Orphanage, to serve as a holiday home for the orphan girls. For some years Judith used it as a café but now she keeps it for private use. For details of Mike Higginbottom’s lecture Fun Palaces: the history and architecture of the entertainment industry please click here. This entry was posted in Fun Palaces, Lancashire's Seaside Heritage on January 26, 2014 by Mike Higginbottom. 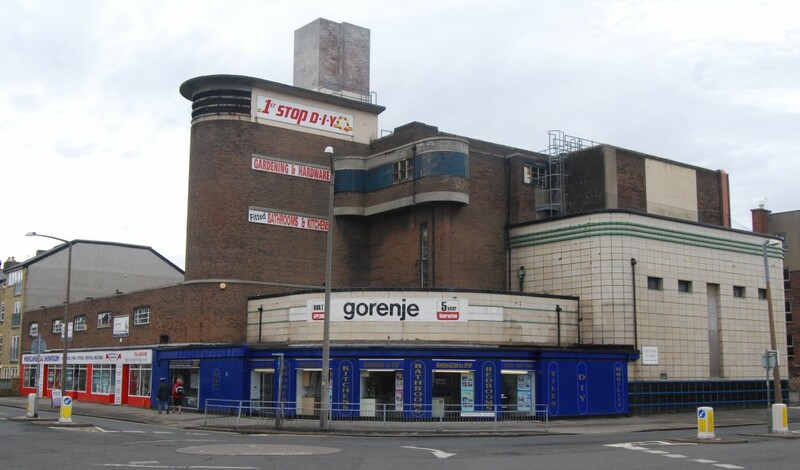 Two things intrigue me about the former Odeon Cinema, Morecambe. Opened in 1937, it’s an absolutely typical product of Oscar Deutsch’s house-architects, the Harry Weedon partnership, featuring a Moderne fin-shaped tower and a quirky projecting exterior corridor, clad in brick and cream faience. It seated 1,084 in the stalls and 476 in the circle: http://cinematreasures.org/theaters/6067. I’m puzzled that it stands some distance from the seafront, so that it was never part of the sequence of promenade crowd-pullers, the Alhambra, the Winter Gardens and the two piers, in the days when Morecambe attracted crowds. It stands on Euston Road, near to the less prominent of Morecambe’s former two stations. I’m also interested to know what state the interior is in. It now earns its keep as a kitchen, bathroom and bedroom showroom for Homemakers 1st Stop: http://www.thehomemakers.co.uk. As soon as you walk in, through what would have been a side exit, it’s clear that you’re standing in the stalls, with the curve of the balcony overhead, but a suspended ceiling hides the auditorium space. The lady behind the counter told me she’s never actually been in the circle, which is blocked off, but she’s been told that the projection box remains intact. This entry was posted in Fun Palaces, Lancashire's Seaside Heritage on January 23, 2014 by Mike Higginbottom. In the back streets of Morecambe’s West End, usefully employed as a specialist community centre, lies a long-forgotten music hall. The Devonshire Hall was built in 1899, seating eight hundred people, two hundred of them in the balcony. It consists of a ground-floor that must always have been shops, and at first-floor level a flat-floored auditorium. Dangerfield’s General Entertainment Guide (1901) informs potential letting clients of “Has no dramatic license [sic];… Platform permanent 14 by 12 deep with electric footlights; Terms one night 40s, a reduction made for a longer period; Extras electric light per meter; Has dressing rooms”. The building was divided in the 1930s, the upper floor used a snooker hall while the ground floor became a paint factory. 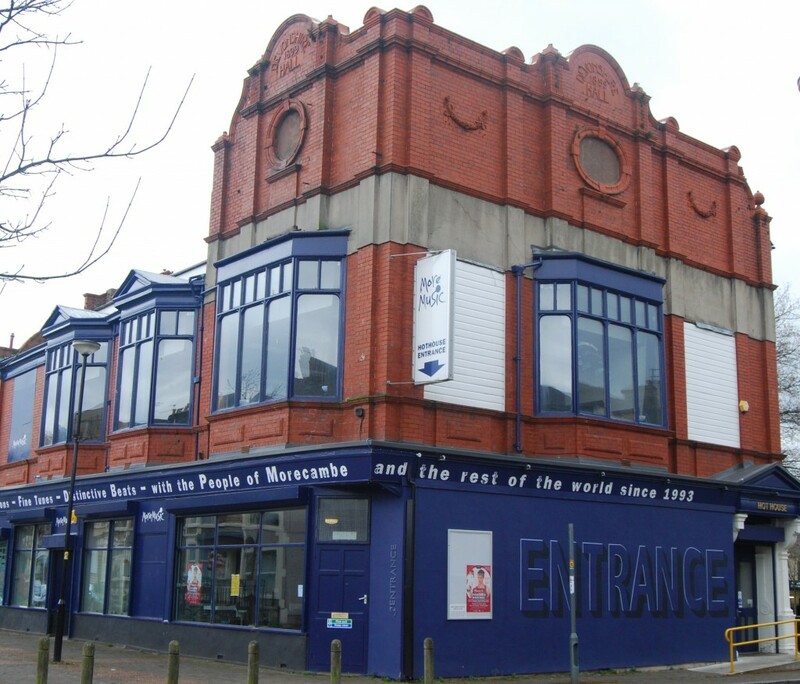 In 1996 it became a music centre and rehearsal space, The Hothouse, for More Music, a community music and education charity founded in 1993: http://www.moremusic.org.uk. The first phase of renovation by seven architecture [sic] [http://www.sevenarchitecture.co.uk/projects/category/id/1/project/2] was completed in 2011. The fine original timber and steel roof remains in situ but is invisible and inaccessible above a suspended ceiling. 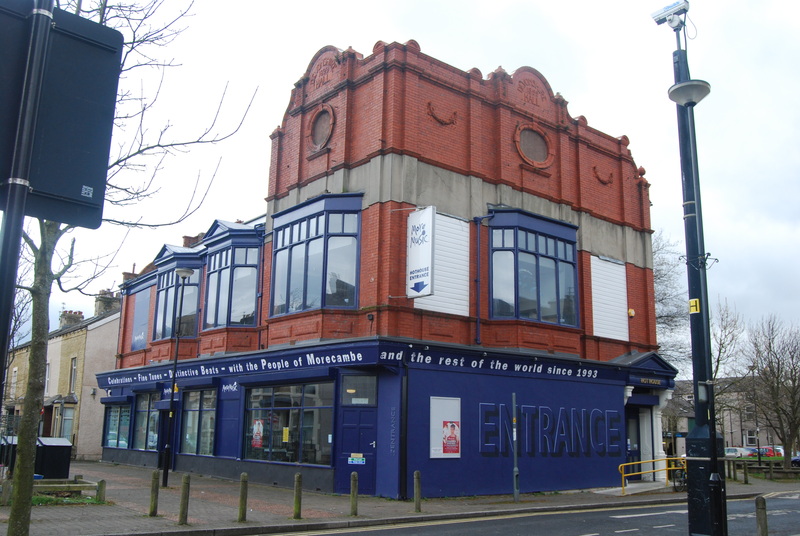 The not-for-profit occupiers have put the building to excellent purpose – http://www.thevisitor.co.uk/news/morecambe-and-district-news/more-music-announced-as-chosen-charity-1-5471446 – and given it a better chance of survival than most of Morecambe’s entertainment heritage has had. This entry was posted in Fun Palaces, Lancashire's Seaside Heritage, Victorian Architecture on January 23, 2014 by Mike Higginbottom. 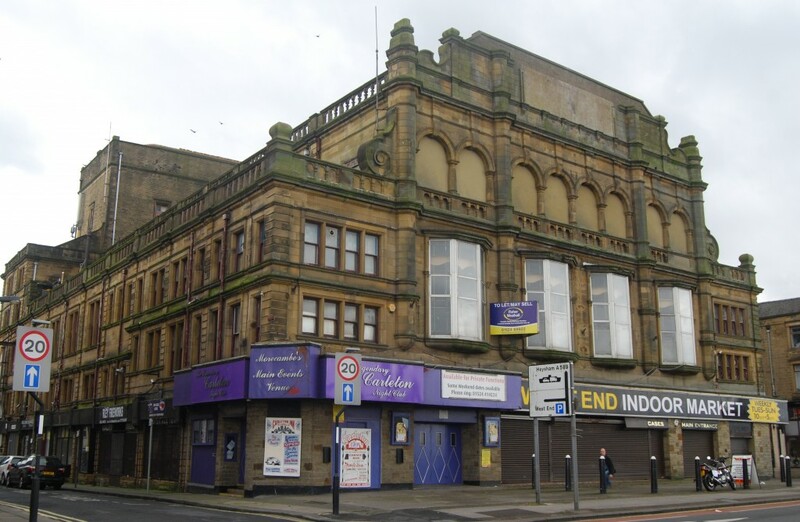 The Alhambra Theatre, Morecambe, the location of Laurence Olivier’s performances as Archie Rice in the 1960 film The Entertainer, still exists though its interior has gone. A major fire in 1970 completely destroyed the auditorium, including its roof, though the stage-tower remains. When the shell was rebuilt the Dutch gable of the façade was removed and the proscenium opening was bricked up. According to Tony Parkinson [‘Morecambe’s early cinemas’, Cinema Theatre Association Bulletin Vol 46, No 5 (September/October 2012), p 5] the interior of the fly tower remains intact. 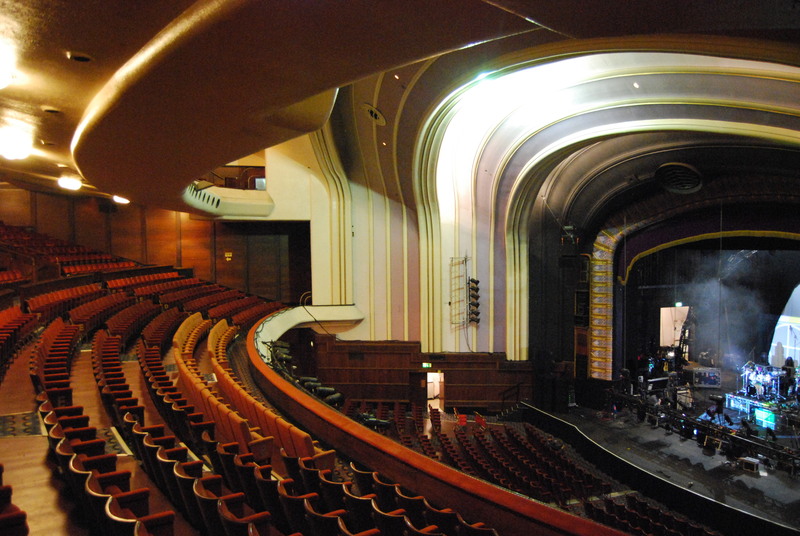 The Alhambra was designed by the local architect Herbert Howarth as a music hall and opened in 1901. 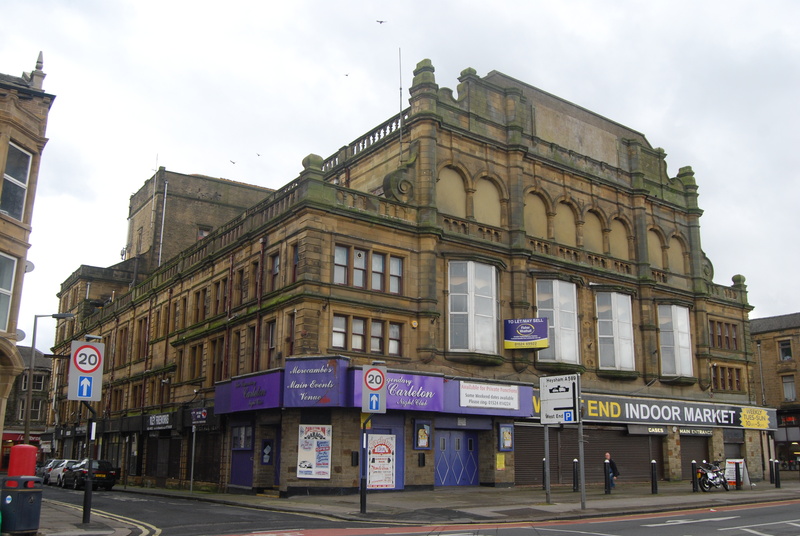 Because it replaced the former West End market (1889), its ground floor was given over to shops and market stalls, with the auditorium at first-floor level. Built at a cost of £50,000, it was a financial liability from the start. The leader of the consortium that built it, Alderman Gardner, filed for bankruptcy in 1911 with liabilities of £62,257 12s 6d. A new company took it over in 1919 for £50,000 and invested a further £30,000 on replacing the market stalls with twenty lock-up shops, replacing 700 of the 2,000 chairs with tip-up seating and installing a £,3,000 organ. 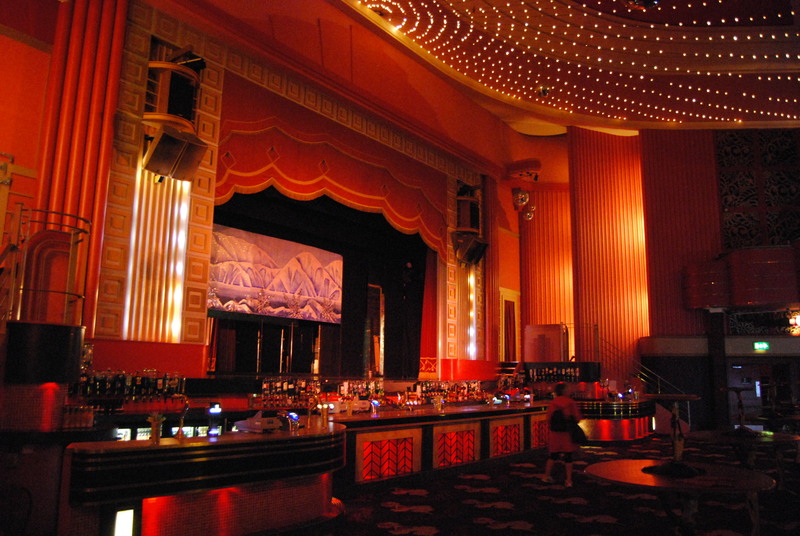 In 1927 it became a cinema full-time, and when sound was installed in 1930 it was renamed the Astoria. 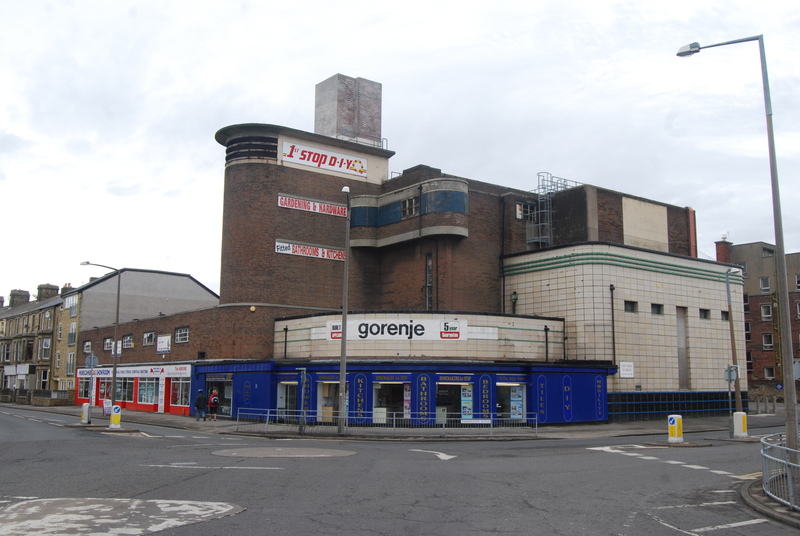 It remained closed throughout the Second World War, and reopened in 1946 as a theatre. After the 1970 fire the auditorium-space became a night club. At present it’s closed. There’s a compilation of clips from The Entertainer, with an oddly inappropriate music track, at http://www.youtube.com/watch?v=IrP-5BvYM68. The great rival of Thomas Sergenson, Blackpool’s late-Victorian theatre impresario, was William Holland (1837-1895), “the People’s Caterer”, who first made his name managing the Canterbury Music Hall, Lambeth [http://en.wikipedia.org/wiki/Canterbury_Music_Hall]. Bill Holland was employed by the Winter Gardens Company specifically to counter the competition from Sergenson. Against the opposition of a number of Winter Gardens directors, including the chairman, Dr Cocker, Bill Holland proposed and carried through the construction of the predecessor of the present-day Opera House, designed by Frank Matcham and built in nine months flat at a cost of £9,098. It opened with a D’Oyly Carte production, The Yeomen of the Guard, on June 10th 1889. As part of the same project, Frank Matcham redesigned the Winter Gardens Pavilion in the form of a proscenium-arched theatre. Bill Holland apparently owned an old grey parrot, which he had trained to say “Going to see Bill Holland’s ballet?” For the Winter Gardens, he initiated The Great Parrot Scheme: he bought a hundred parrots, each in a cage marked “Blackpool Winter Gardens – Two Shows Daily”. The birds were lined up in rows four deep and trained to repeat the grey parrot’s message and were allegedly placed all the leading hotels and restaurants of Lancashire and Yorkshire. The total investment in the Opera House and associated extensions cost the Winter Gardens Company approximately £14,000: gross receipts trebled between 1887 and 1891 to £36,000 and the dividend reached 8%. In response to the opening of the Tower in 1893, Bill Holland persuaded the directors to install electric lighting throughout the Winter Gardens at a cost of £3,307, and to pay an additional £975 to buy out Dr Cocker’s 1875 covenant against dancing, so that he could plan the Empress Ballroom, designed by Mangnall & Littlewood of Manchester (who shortly afterwards built Morecambe’s Victoria Pavilion), with a barrel-vault roof, a balcony promenade and a proscenium stage. 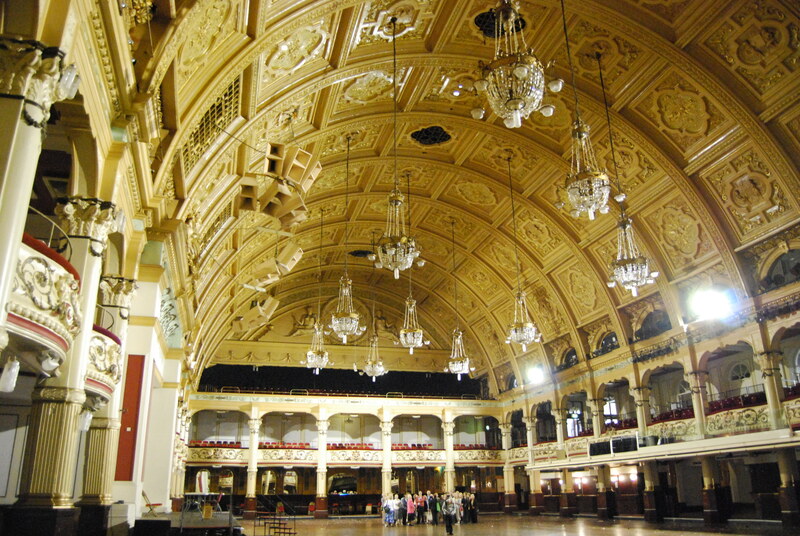 The Empress Ballroom was at the time one of the largest in the world, 189ft × 110ft, with a dancing-area of 12,500 square feet. The Art Nouveau decorative scheme included plasterwork by J M Boekbinder and twenty-eight Doulton tile panels of female figures symbolising jewels by William J Neatby. It opened in 1896, the year after Bill Holland’s death. The Tower Company paid him a posthumous compliment by refurbishing their somewhat functional Assembly Hall as the sumptuous Tower Ballroom. This entry was posted in Fun Palaces, Lancashire's Seaside Heritage, Victorian Architecture on January 22, 2014 by Mike Higginbottom. Blackpool’s oldest theatre, the Theatre Royal, has now gone, destroyed by fire in 2009: http://www.arthurlloyd.co.uk/BlackpoolTheatres/TheatreRoyalBlackpool.htm. In the late nineteenth century its lessee was Thomas Sergenson, who ran a stage-production of Ellen Wood’s East Lynne – “Dead! Dead! And never called me mother!” – for twenty-five summers. He was a smart businessman and made enough money to purchase a plot of land in 1887 to build a Grand Theatre. He initially erected a row of shops with a temporary circus building behind, until it became apparent that he held a prime site between the Winter Gardens and its new rival the Tower, which was started in 1891. Accordingly, he commissioned Frank Matcham to complete the Grand Theatre auditorium at a cost of £20,000 and opened it on July 23rd 1894, two months after the Tower opened, with Hamlet, starring Wilson Barrett. By 1901 Sergenson had bought out his business partners, and he sold the theatre to the Tower Company on December 23rd 1909 for £47,500. Like so many Victorian theatres, the Grand was threatened with demolition: in 1972 it was planned to demolish it to make way for a department store. 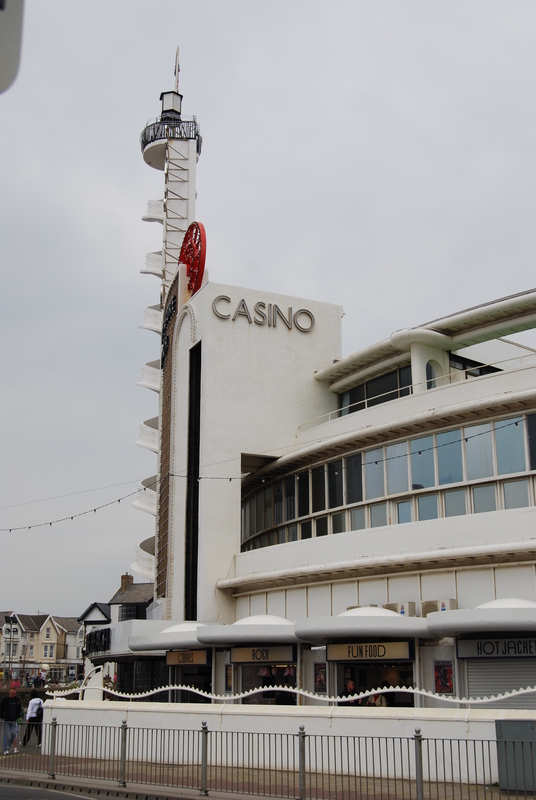 It was restored, after vociferous public protest, first as a bingo house, and then sold for a quarter of a million pounds to its present owners, the Grand Theatre Trust. It was reopened as a theatre by HRH the Prince of Wales on May 29th 1981. This entry was posted in Fun Palaces, Lancashire's Seaside Heritage, Victorian Architecture on January 21, 2014 by Mike Higginbottom. 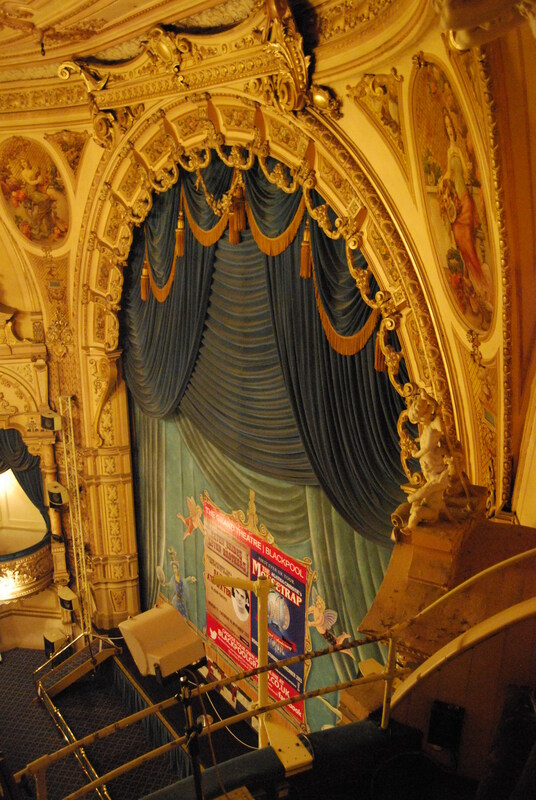 Blackpool’s Opera House is the third on its site – a lavish art-deco design by Charles MacKeith, with two balconies and a total seating-capacity of 2,920. The full stage-width is 110 feet, with a proscenium opening of 45 feet. The opening-ceremony on July 14th 1939 was performed by Jessie Matthews, who was appearing in I can take it at the Grand Theatre just down the road, with an organ-recital including a duet by Horace Finch, the Winter Gardens’ resident organist, and Reginald Dixon. The stage show included a train-wreck scene incorporating a full-size replica of the Royal Scot locomotive. The first variety bill at the reopened Opera House starred George Formby Jnr (who was paid £1,000 a week) in a review entitled Turned out nice again. The Opera House was the venue for the first Royal Variety Performance to take place outside London, in April 1955. This entry was posted in Fun Palaces, Lancashire's Seaside Heritage on January 19, 2014 by Mike Higginbottom. Apart from being great fun, the Pleasure Beach has a long, proud history as part of Blackpool’s entertainment culture and as a hugely successful business dedicated, in the words of its former director, Leonard Thomson, to “separating the public from their money as painlessly and pleasurably as possible”. Leonard Thomson was the son-in-law of one of the co-founders of the Pleasure Beach, William George Bean, who brought an American Hotchkiss Bicycle Railway to Blackpool’s South Shore in 1895 and collaborated with a Yorkshire meat-trader, John W Outhwaite, to import other rides from Coney Island to set up a permanent fairground on what had previously been a gypsy encampment. Their ambition was to create, in the words of W G Bean, “…an American Style Amusement Park, the fundamental principle of which is to make adults feel like children again and to inspire gaiety of a primarily innocent character”. In 1906 they contracted for an electricity supply from the Tramways Department, which meant that the rides could operate into the evening, which in turn increased the traffic on the tramway. When the Corporation widened the Promenade across the site in 1913, Bean and Outhwaite secured an advantageous agreement that no amusement facilities or tram services would be permitted further south for fifteen years. 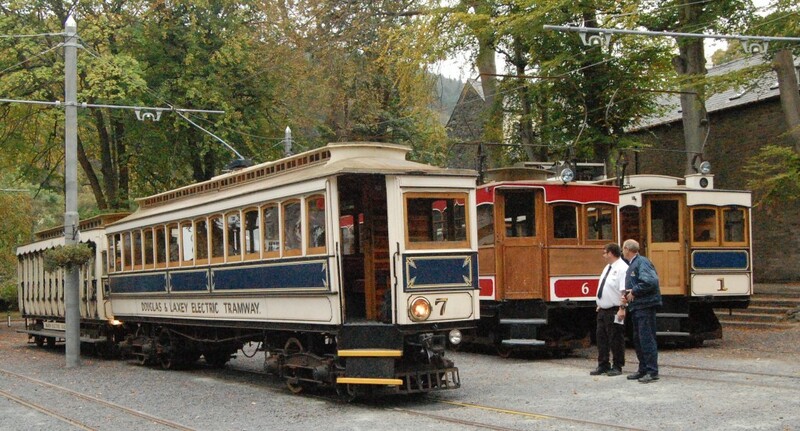 Their price for varying this agreement when the trams were extended to Starr Gate in 1926 was that all trams made a compulsory stop at the Pleasure Beach, and those trams terminating there showed the destination “Pleasure Beach” rather than “South Shore” – providing free advertising that continues to this day. When Leonard Thompson died in 1976 his widow Doris became Chairman and their son, Geoffrey Thompson, Managing Director. Mrs Thompson made a point of testing each new ride as recently as 2002 when, aged 99, she rode the Spin Doctor. Geoffrey Thompson ran the company until his death at the age of 67 in June 2004: his mother died, aged 101, shortly after her son’s funeral. The company is now operated by Geoffrey’s children, Amanda and Nicholas Thompson. The Pleasure Beach website is at http://www.blackpoolpleasurebeach.com/home. This entry was posted in Fun Palaces, Lancashire's Seaside Heritage, Life-enhancing experiences on January 17, 2014 by Mike Higginbottom.